As a social media consultant, I canâ€™t help but immerse myself fully into the digital realm. You canâ€™t just dip your toe in the metaphorical social ocean, you have to be in it 24 hours a day, seven days a week. If you canâ€™t reel off a list of hashtags trending on Twitter on any given day or you donâ€™t know what video is currently going viral then youâ€™re not doing it right! Social media is new, exciting and ever changing, it’s therefore essential weâ€™re always at the forefront of the industry. With this in mind, weâ€™re always looking for new things to capture and engage new audiences and make sure our clients are also at the top of their game. With this in mind, naturally we will look to big brands for inspiration, follow those that are absolutely smashing their social media strategy and look to ways we can implement this with our own client base. Extraâ€™s decision to launch a romantic video outside of the Valentineâ€™s market may have left a few people confused, however itâ€™s clear this was one of the companyâ€™s best moves. Boosting the video on the social channels, Extra let the public do the marketing for them. People watched the video, cried a puddle of tears and then took to Twitter to share their thoughts on crying over a chewing gum commercial. A great example of a simple formula, executed perfectly to create some fantastic results. #TBT is the fourth most popular hashtag on Instagram and Expedia made every social media consultant green with envy when they made it their own with an impressive competition. Every Thursday in August they asked people to tag @Expedia into their #TBT pictures of old holiday photos, using the hashtag #ThrowMeBack. Each week they picked one lucky Instagrammer who won vouchers so they could feed their nostalgia and travel back to the places where the photos were taken. During the 10 week campaign, not only did they naturally associate themselves with one of the biggest hashtags they also doubled their Instagram following and received almost 5,000 competition submissions. The campaign also created over 5 million impressions and 300K total engagements. 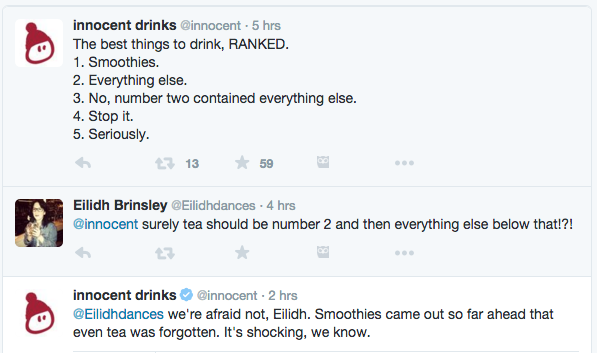 Iâ€™ve always loved Innocentâ€™s marketing strategy. From itâ€™s humble beginnings itâ€™s always opted for the fun and quirky style – those small personal touches on the packaging, the fact that I could contact â€˜Fruity Towersâ€™ for a chat if I was so inclined. So since the launch of their social channels, theyâ€™ve been the envy of many social media marketers, myself included. They produce consistently great content which is both fun, unique and witty, but the thing that really stands out for me is their ability to carry a unique voice across all social media channels. Theyâ€™re incredibly customer-centric and have a fantastically friendly and humanised approach when it comes to engaging with their audience, connecting with people on a one-to-one basis. 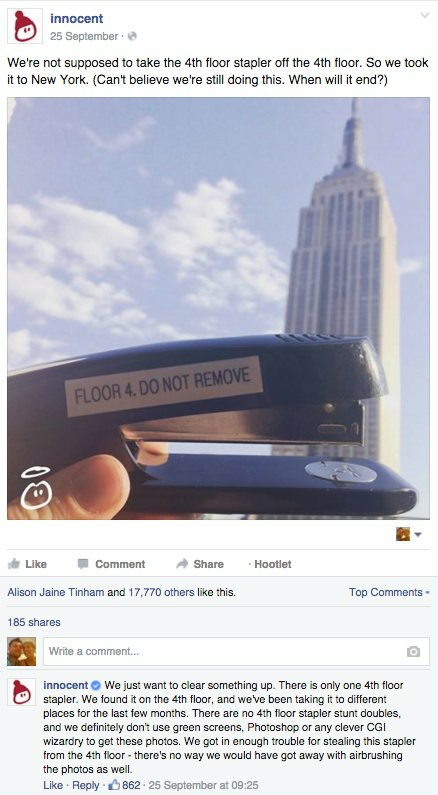 Even when youâ€™re responding and engaging with your social audience on a regular basis, it can still prove difficult for brands to humanise their approach, whereas Innocent always manage to provide personal, fun and witty responses on their social channels – leading to further engagement, shareable content and good publicity.